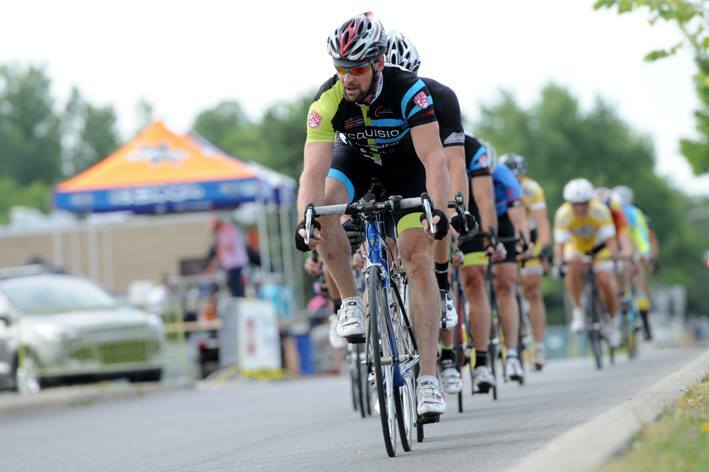 It is no secret that Acquisio President and CEO, Martin Le Sauteur, has a passion for cycling. He can often be seen cycling to work in his Acquisio branded sports gear and he and several other cycling enthusiasts make good use of the in-office shower installed to encourage bike rides to and from work. But it’s not just the employees who wear the Acquisio cycling shirts with pride. This year Acquisio started sponsoring a competitive cycling team, and the team has seen incredible success so far this season. At a recent cycling championships, “Championnat Québécois Critérium élite Megavolt,” in Saint-Jean-sur-Richelieu, several of the Acquisio cyclists were among the top finishers in their categories. The Masters category is further divided into subdivisions to separate cyclists in their 30s, 40s, 50s and 60s. The Acquisio competitive cycling team consists of riders from Junior to Master levels, and at this particular event the Master cyclists over 40 years old performed exceptionally well. With hundreds of competitors, Acquisio cyclist Stephane Lebeau placed fourth in the Masters 2 category, just missing the podium, and Christian Girard, another Acquisio Master cyclist, was fifth in the Masters 3 category. Congrats gentlemen, keep racing hard! 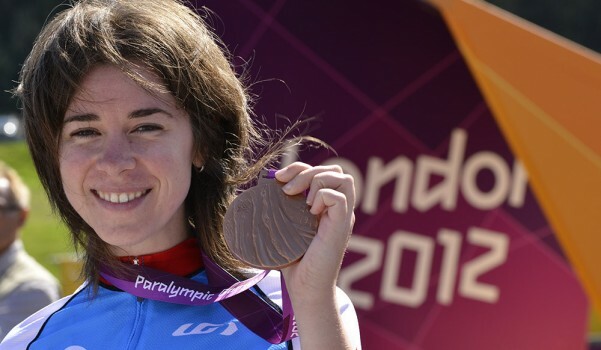 Another Acquisio athlete that just missed the podium was Marie-Claude Molnar, who competed in the Para-Cycling Road World Championships in South Carolina. She was just 18 seconds behind the third place winner, but with dozens of countries and thousands of attendees, a fifth place finish is something to brag about. Molnar has something else to brag about, though. Before joining the Acquisio competitive cycling team, she competed in the London 2012 paralympic women’s individual time trials for road cycling, and won the bronze medal for Canada! Not only are we proud to have an Olympic athlete on the team, but we are proud of her continued success and persistence. Having competed in cycling events all her life, when in 2005, Molnar was struck by a car at 110km/h and left with a brain injury, she refused to give up cycling. Her continued success is inspiring. Acquisio is proud to support Marie-Claude Molnar, hopefully all the way to the Paralympics in Rio in 2016. 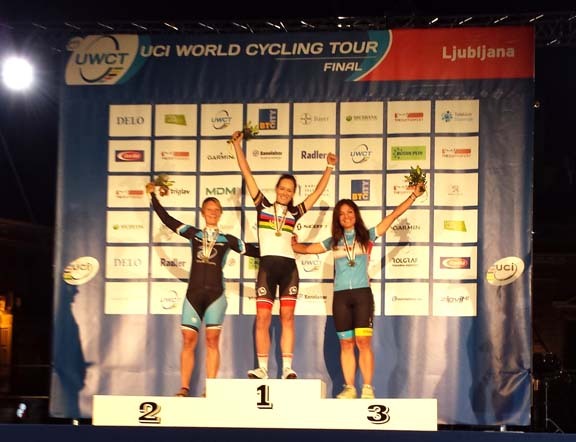 Another talented female rider on the Acquisio cycling team, Zeina Loutfi, competed at the Amateur World Championships, this year held in Slovenia. Not only did she make Canada proud by being just one of 7 Canadian present among the 1,600+ cyclists, but she won bronze in her category! The Acquisio cyclist, who almost claimed gold at an earlier competition, “la Coupe des Amériques,” earned her medal in the Women’s 35-39, 18.6km race with a time of 27 minutes and 30 seconds (less than 40 seconds behind the first place winner). Bravo Zeina! With more than 40 countries present at the World Championships, this is a huge victory for Zeina, the entire Acquisio team and Canada. Thank you to all the hard working Acquisio cyclists, Congratulations and keep up the incredible work.